Front Fixed Panel: 10" Glass Door: 25" Side Fixed Panel: 30 in. With an integrated design, beauty and functionality the Aston SD908 semi-frameless 36 in. x 36 in. round bypass sliding door shower enclosure is the ideal shower solution. The final touches on this model will complement any renovation - traditional or contemporary. With features including 5mm ANSI-certified premium clear glass, either chrome or stainless steel finish hardware and magnetized door channels, this enclosure potrays beauty and functionality on a budget. This model does not include the matching 2.5 in. low-profile acrylic base. A modern space-saver by design, the Aston SEN973 36 in. x 36 in. x 77.5 in. neo-angle semi-frameless luxury shower enclosure with matching base defines design, functionality and quality. 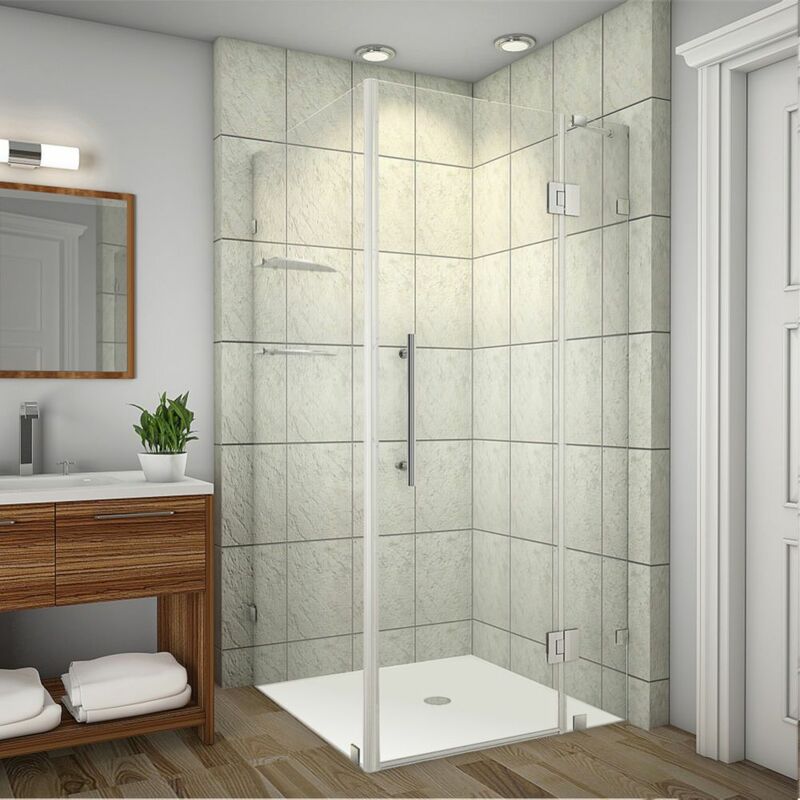 By adding a luxurious corner focal point, with the premium 10 mm ANSI-certified tempered clear glass, choice of chrome or stainless steel finish, reversible door configuration, built-in towel bar handle and minimal hardware will not go unnoticed. Make your showering experience a luxurious getaway every time with this beautiful, contemporary enclosure. This model includes the 2.5 in. low-profile acrylic fiberglass-enforced matching shower base. A modern fixture that is as luxurious as it is practical, the Aston SEN975 48 in. x 35 in. x 75 in. rectangular semi-frameless hinge pivot enclosure is the perfect solution for an upcoming remodel project. Complete your next renovation with its many features and beautiful appointments. Accentuated with your choice of either chrome or stainless steel finisheded hardware, premium 10mm ANSI certified tempered glass, deluxe full-length seal strips to prevent leakage and reversible door configuration (for left or right handed door installation), this shower enclosure will add luxury and functionality to your bath instantly. 2.5 in. acrylic low-profile shower base not included. A modern fixture that is as luxurious as it is practical, the Aston SEN975 60 in. rectangular semi-frameless hinge pivot enclosure with Right Drain base is the perfect solution for an upcoming remodel project. Complete your next renovation with its many features and beautiful appointments. Accentuated with either chrome or stainless steel finished hardware, premium 10mm ANSI certified tempered glass, deluxe full-length seal strips to prevent leakage and reversible door configuration (for left or right handed door installation), this shower enclosure will add luxury and functionality to your bath instantly. This model includes matching 2.5 in. acrylic low-profile right-drain shower base. Avalux GS 35-Inch x 30-Inch x 72-Inch Frameless Shower Stall with Glass Shelves in Stainless Steel The Avalux GS completely frameless square/rectangular hinged shower enclosure with glass shelving series provides a contemporary, upscale showering experience in your existing shower space. Available in a number of sizes, the Avalux comes ready to install, complete with 10mm ANSI-certified clear tempered glass, chrome or stainless steel finish with stainless steel composite hardware, Self-Centering hinges, premium clear leak seal strips and engineered for reversible left or right-hand hinged pivot door installation. The GS class includes a two-tier glass shelving system with added convenience and sophistication. This model includes a 5 year warranty; base not included. Avalux GS 35-Inch x 30-Inch x 72-Inch Frameless Shower Stall with Glass Shelves in Stainless Steel is rated 3.0 out of 5 by 1.